Early Intervention programmes enhance the development of infants and toddlers with disabilities, minimise potential developmental delay, and reduce educational costs to our society by minimising the need for special education services when children with disabilities reach school age. Decades of rigorous research show that children’s earliest experiences play a critical role in brain development. Neural circuits, which create the foundation for learning, behaviour and health, are most flexible or “plastic” during the first three years of life. Over time, they become increasingly difficult to change. Persistent “toxic” stress, such as extreme poverty, abuse and neglect, or severe maternal depression can damage the developing brain, leading to lifelong problems in learning, behaviour, and physical and mental health. Early social/ emotional development and physical health provide the foundation upon which cognitive and language skills develop. 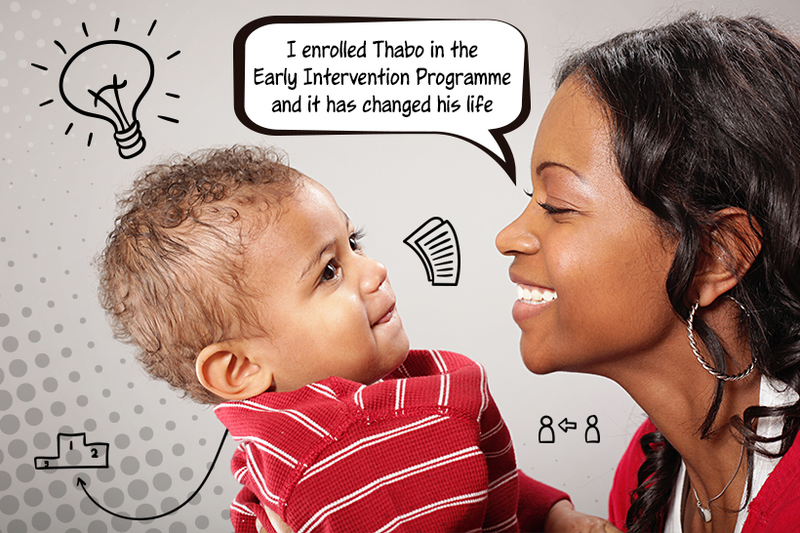 Sunshine offers Early Intervention projects in Craighall, Eldorado Park, and Elsburg (Germiston). These projects cater for children aged 18 months to 7 years with intellectual, physical and developmental disabilities and delays. At two of the projects (Craighall and Eldorado Park) we also cater for able-bodied preschool children as part of the Inclusion Programme. The sizes of the classes are kept down to a minimum, with an average of 10 children per class to ensure individual attention. Day care programmes run from 8:00 am until 1:00 pm with an Aftercare programme available at the Craighall centre. The Gauteng Department of Education school terms are followed. The children are supplied with two nutritious meals daily. School fees are determined by affordability of parents/families and a bursary facility is available should the family meet the required criteria. All classes are managed by a practitioner with a minimum of level 4 Early Childhood Development Qualification. Feel free to speak to one of our friendly team for more information about Early Intervention for your child.